Good morning and welcome to day four of The Valentine’s Day Countdown: 21 Ways to Meet a Mate. Here’s an idea you can put into action tomorrow…and if you don’t meet someone interesting, you can dive into one of the many weekend projects you’ve probably been putting off. Win-win! Jan. 28: Happy hour not all that fruitful? Instead of heading home, stop in at Home Depot (or your favorite home improvement store) and see who’s there on a Friday night. Good chance some of them are single (and industrious, too!). 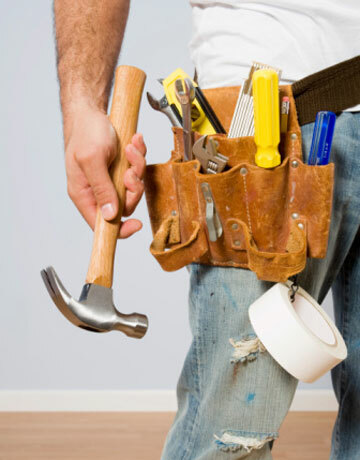 What not to say: "Hey, baby, wanna check out my tool belt?" Jan. 27: Attend your friend’s friend’s party. You’ll be sure to meet someone new if you break away from your usual crowd. Jan. 26: Don’t complain about the snow, get up and go! (Thankfully, I’m not about to suggest a poetry reading. The rhymes stop here, I promise.) Ski a few runs, then head for the lodge with those cute flushed cheeks and check out the scenery. And don’t forget to say “hi,” it works much better than a cheesy pick up line. Have you made your New Year’s resolutions yet? Have you followed the wise advice of all the “experts” and set reasonable, attainable goals? And you’ll find people who make very reasonable resolutions…who resolve to “live flirtatiously” or simply to go on more dates. Some resolve to try online dating for the first time and some resolve to never try it again. Still others promise not to be “that guy” with the bad lines that make women uncomfortable. Of course, I hope you’ll resolve to give Greenlighting a try. But more than that, I hope you’ll resolve to look at this year as a year of possibility. A year of possibilities when it comes to dating, sure. But beyond that too. Let it be a year full of all kinds of possibilities. I think waking up with a sense of possibility is the coolest thing about the New Year. Every January 1st, I take a deep breath…the frenetic, fun holidays behind me, remembered fondly and with a slight sense of relief. And a whole new year ahead. I love that feeling. And if you resolve to look at this entire year as a year of possibility, you don’t have to wait until 2012 to feel that sense of possibility again. Possibility is all around us, every week, every month, all year long. Tomorrow, for me anyway, is my getting-back-to-a-routine day. There’s a sense of possibility in that. The good feeling of focusing on work, getting things done, and regaining a sense of order and organization (okay, I don’t really have a sense of organization, but there’s a possibility it will present itself one of these Monday mornings!). I’m thinking of throwing a party in January, since I didn’t manage to host one during the holidays. There’s nothing like a party to add a sense of possibility to your week. Except perhaps a vacation. Traveling, especially when I’m headed someplace I haven’t been before, is my favorite way to add a sense of “who knows what’s around the corner” to my everyday life. The point is, possibilities abound. They exist when you discover a new restaurant, when you walk out of Home Depot with fresh cans of paint, when you change the color of your hair or your choice of exercise. So get used to that sense of possibility. It gives you a fresh outlook on life in general. We create many of our possibilities, but there are also plenty of surprises waiting for us. And while some of those surprises will knock us down, many will make our lives happier–for a moment or for much longer. Embrace the idea that something good may be right outside your door. I agree with the “experts” that you should make at least some reasonable resolutions. A sense of accomplishment is wonderful. We all need that. I also think one or two wild, pie-in-the-sky resolutions are great too. If we never want more, we’ll never get it, right? But most of all, I think we should all have at least one resolution that’s about attitude adjustment…not about what we do, but about how we see, what we feel, and who we are. I’ve noticed that things usually start at a simmer and heat up. Attraction. Interest. They happen all the time, if you’re paying attention. But explosive, “you are THE one” fireworks? That’s something that happens much less often, and I’m not sure it’s all that trustworthy when it does happen. What starts with a bang often ends in a crash. The thing is, if you’re expecting fireworks, you might not even notice the more modest form of attraction. The person you feel completely comfortable with. The person you aren’t trying to impress. The person you think of telling first when something funny happens. Give that person a chance. Maybe the person you’re meant to be with is someone you already know. When Carol heard about Greenlight Cards, she thought they were a great idea for when you meet someone and think there’s a connection, but aren’t quite sure. Give that person a Greenlight Card and find out. Or when you’ve known someone for a while but suddenly start to feel something that wasn’t there before. Like Carol, I think Greenlight Cards give you an opportunity to open the door to new possibilities. See Carol’s video and then, if you’re so inspired, send us one of your own. You say it’s your birthday? Well, it’s my birthday, too! It made me wonder what the odds are that you will fall in love and live happily ever after with someone who shares your birthday. So I googled “odds of marrying someone with the same birthday” and ended up swimming in math formulas on wikipedia. I think the gist is that it’s not all that unusual to meet someone with the same birthday. According to wikipedia (so it must be true), “In a group of at least 23 randomly chosen people, there is more than 50% probability that some pair of them will have the same birthday.” But that didn’t answer the marriage question. More googling—anything to get away from all those math formulas. Clearly, the odds must be much slimmer but, alas, I didn’t find any solid evidence to support this theory. What I did find were many anecdotal accounts of married couples who have the same birthday, along with one birthday-sharing couple wondering if they should get married. They all seemed to think they were unusual, in a good way. I have no idea what the astrologists out there would say about these couples (if you’re into astrology, make sure to comment on this post), but I do think there are times in life when something unusual or unexpected makes us take notice. The moral of the story: don’t ignore the weird signs that the universe sends you. And be happy for anything that sparks a conversation or encourages a connection you might otherwise miss. More important, make sure to celebrate your birthday—loudly, publicly, with friends and with strangers. You might just find someone attractive to celebrate with.